If you have not had the chance to work with Salt yet, it is a very exciting new configuration management system that is easy to get up and running, powerful enough to support distributed command execution and complex configuration management, and scalable enough to support thousands of servers simultaneously. Recently, I wrote about how a de facto containerization standard will enable a whole new generation of management tools. Back in January, SaltStack announced several awesome new features in the Salt 2014.1.0 (Hydrogen) release, including support for the life-cycle management of Docker containers. SaltStack is very early in getting Docker support, and Docker itself still does not consider itself production-ready (tell that to Yelp and Spotify), but together these tools offer an out-of-the box solution for getting started with immutable infrastructure. The deployment and management of an application across multiple virtual machines, using multiple public clouds, is a use case that would have been considered categorically “hard” just a year ago. Companies like Google, Facebook, and Ning spent many years developing this kind of orchestration technology internally in order to deal with their scale challenges. Today, using Docker containers, together with Salt-Cloud, and a few Salt States, we can do this from scratch in a few tens-of-minutes of effort. And, because we are using Salt’s declarative configuration management, we can scale this pattern to actually operate our production environment. The core use case is one or more application containers which we want to deploy on one or more virtual machines, using one or more public cloud providers. In order to simulate a real-world application, will create a Docker container with the Apache web server. Conceptually, this container could be a front-end proxy, a middle tier web service, a database, or virtually any other type of service we might need to deploy in our production application. To do that, we simply create a Dockerfile in a directory in the normal way, build the container, and push the container to the Docker repository. [email protected]:/some/dir/apache# docker build -t jthomason/apache . With our demo application successfully pushed to the Docker registry, we are now ready to proceed with orchestrating its deployment. As mentioned previously, we assume you have a Salt master installed somewhere. If not, you’ll need to follow the documentation to get a Salt master installed. The next step then is to configure Salt-Cloud for your choice of public cloud provider. Configuring Salt-Cloud is simple. We need to create an SSH key pair that Salt-Cloud will use to install the Salt Minion on newly created VMs, add that keypair to our choice of public cloud provider, and create a Salt-Cloud configuration file with the API credentials for our public cloud. Your public key has been saved in digital-ocean-salt-cloud.pub. With Digital Ocean now enabled with our SSH keys, next steps before provisioning time are to configure salt-cloud with Digital Ocean’s API key for our account, and define the profiles for virtual machine sizes, geographic locations, and images for Digital Ocean. The salt-cloud configuration for credentials are kept on the salt-master in /etc/salt/cloud.providers.d/, while the profiles for each public cloud are kept in /etc/salt/cloud.profiles.d/. See the salt-cloud documentation for more details on configuration options. It is now time to configure Salt to provision our application container. To do that, we need to create two Salt states, one to provision Docker on a newly created VM, and another to provision the application container. Salt states are Salt’s declarative configuration states, which are executed on target hosts by the salt-minion. States are an incredibly rich feature of Salt, one that could hardly be covered with any sufficient level of detail in a tutorial like this. This example is not a particularly smart or optimal use of states, but it is simple. You’ll want to read up on Salt states to develop the best practices for your environment. Now that configuration is complete, we are now ready to provision 1..n virtual machines, each with a running instance of our application container. Before we do that, let us first verify that the Salt master is actually working. We know there is at least one agent that should be talking to this salt-master at this point, which is the agent running on the salt-master itself. Satisfied that everything is in working order with the salt installation, we can now provision our first virtual machine with an instance of our container using salt-cloud. We have established the basic setup and management pattern for our infrastructure. Adding additional public clouds is easy, thanks to salt-cloud, providing a single control interface for our entire application infrastructure. But where to go from here? A starting point is to consider how salt states can be used to manage VM and container life-cycles, in the context of the overall continuous integration and deployment process. I plan to share some of my thoughts on that specifically in a future post. Obviously, there is a lot of thought to be given to your specific objectives, since that will ultimately determine the deployment and operations architecture for your application. However, Salt is an incredibly powerful tool that, when combined with Docker, provides a declarative framework for managing the application life-cycle in the immutable infrastructure paradigm right out of the box. That versatility puts a whole lot of miles behind you, allowing you to focus on other core challenges with application deployment and operations. I do the same with openstack, docker/kvm and saltstack. 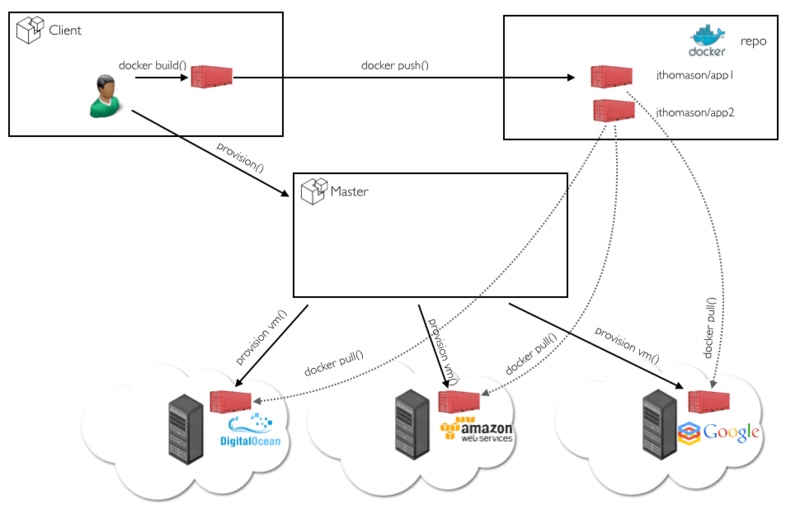 Great article, do have article for saltstack + docker minus the cloud. Askar, I do not have an article with just Salt and Docker, but I will take that as a suggestion for a future post. It seems like you forgot to mention the application of the highstate module or am I missing something ? salt-cloud will only provision the VM, but the states should be executed with salt command after. Maybe it is automatically done with the curl-bootstrap-git in the profile file, but it is not clear. By the way, this is an interesting use case, but I was looking for something else. I would like to provision dockers on a host machine with salt-cloud as if they were on vms on a cloud. 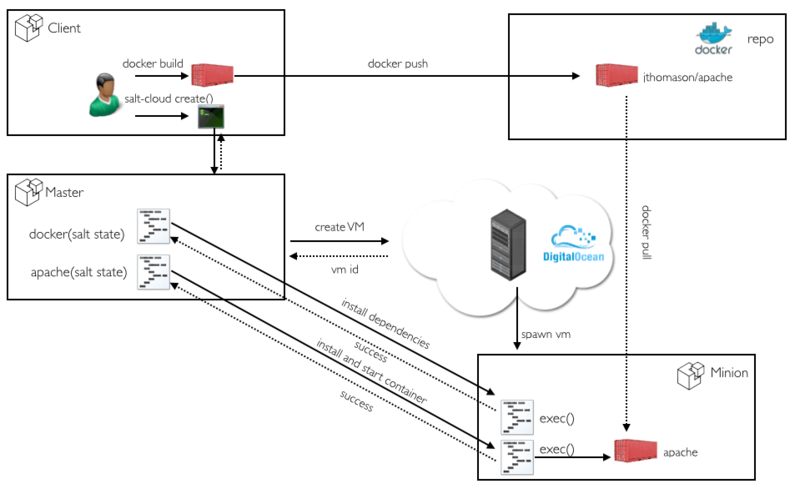 Our dev team uses dockers to share all of our architecture components, but then we are provisionning vm on AWS cloud. We do not want to provision dockers on AWS, as we think that having containers on a virtual machine seems to be overkilling. Moreover, AWS billing system is based on hourly running vms, with dockers inside, the vm must be on all the time. The nodes do come up with high state, give it a try and it should work fine. I think a lot of people will use container-on-vm just to simplify the deployment and management of their applications. With containers, the tangled mess of dependencies and configuration is neatly within the container build time. So, I expect people will move to a more “immutable infrastructure” model, where they make changes by building new containers, and replacing old containers in the environment. Make sense? Maybe we can consider dockers as another shipment type for our applications regardless of the hosting system being virtual or not. Then you are right people will probably just build new containers like they do with rpm or deb.